The Bulgarian National Bank has issued (17th September) the fifth entry in a series of coins entitled “Medieval Bulgarian Rulers,” which has been issued intermittently since 2011. The latest coin features the Bulgarian ruler Ivan Asen II (circa. 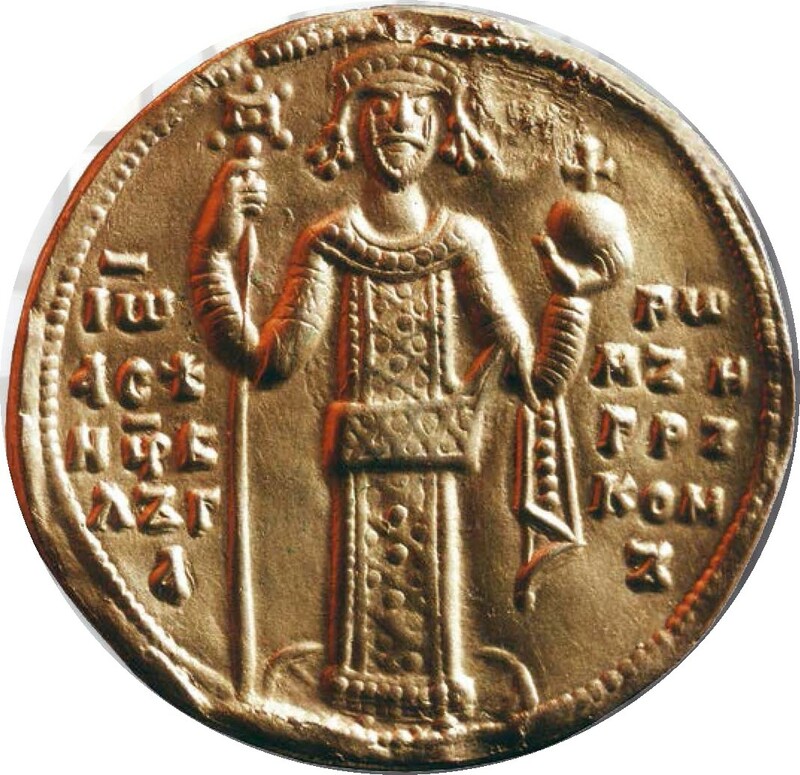 1193–1241) who became emperor of the Bulgarian lands in 1218 and ruled until his own death in 1241. The medieval history of Bulgaria begins with the loss of eastern flanks of territory belonging to the Byzantine Empire to an invading Bulgar force, who were themselves Turkic semi-nomadic warrior tribes in the late 7th century. The Bulgars then founded the first unified Bulgarian state in 681 A.D., which dominated most of the Balkans and significantly influenced Slavic cultures, including the development of the Cyrillic script. The First Bulgarian Empire lasted until the early 11th century when Byzantine emperor Basil II (reigned 976–1025) conquered and dismantled it. It would not be until 1185, nearly 190 years after the defeat of the last ruler of the First Bulgarian Empire, that a second empire was established after the successful revolt which saw the ascent of the Asen dynasty and its first ruler Ivan Asen I in 1187. The Second Bulgarian Empire is said to have reached its apex in terms of power, influence, and territory under the son of Ivan Asen I, who ascended the throne in 1218 as Ivan Asen II. After numerous exhausting wars and feudal strife, the Second Bulgarian Empire disintegrated in 1396 with its territories eventually being brought under Ottoman rule for nearly five centuries. Ivan Asen II was still a child when his father Czar Ivan Asen I (d. 1196), who was one of the founders of the Second Bulgarian Empire, was killed in 1196. Ivan Asen I was succeeded by his younger brother Kaloyan (circa. 1170–1207) who was in turn succeeded by Boril, a nephew and son of an unknown sister of Ivan Asen I, and Kaloyan, who ruled from 1207 to 1218. It was his war against the empire of Thessalonica and Theodore Komnenos Doukas, in the Battle of Klokotnitsa in 1230, that enabled Ivan Asen II to add substantial territory to Bulgaria. That year, the Emperor Theodore Komnenos Doukas unexpectedly invaded Bulgaria along the River Maritsa, despite the two having already signed a treaty of peace. The Epirote and Bulgarian armies clashed at Klokotnitsa in March or April, with Ivan II Asen personally commanding the reserve troops which included 1,000 Cuman mounted archers. As he headed into battle, legend has it that he held a copy of his peace treaty with Theodore high in the air while marching into battle as a reference to his opponents’ betrayal. As Komnenos Doukas’s empire soon collapsed in defeat, Ivan Asen was able to conquer large territories in Macedonia, Thessaly, and Thrace. He would, as a direct result, gain control of all the trade on the Via Egnatia, a road constructed by the Romans in the second century B.C. This immense path that crossed through Illyricum, Macedonia, and Thrace, was itself a continuation of Via Appia. This huge span of trade, and its control under a single authority, enabled Ivan Asen II to implement an ambitious building program in Tarnovo and to strike gold coins in his new mint in Ohrid. The date of Ivan II Asen’s death is unknown, but recorded evidence suggests that Ivan II Asen’s son and successor, Kaliman I Asen (1234–1246), signed a truce on the feast of Saint John the Baptist on the 24th June and it was written that Ivan Asen II had already died by this date. Kaliman I Asen was in turn succeeded by his half-brother, the younger son of Ivan II Asen, as Michael II Asen, who ruled for about 10 years. 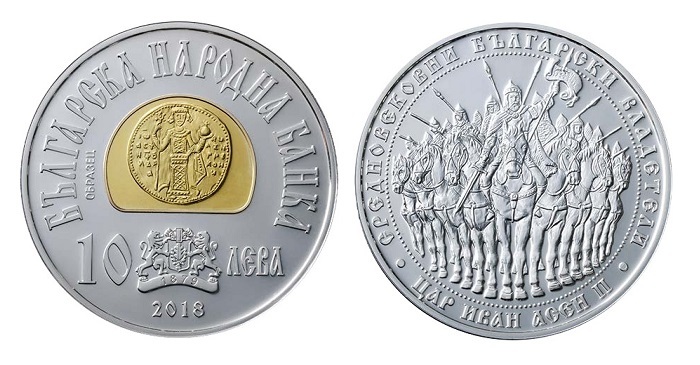 The coins are produced by the Mint of Bulgaria on behalf of the National Bank, at their facilities in Sofia, and are designed by Elena Todorova and Todor Todorov. 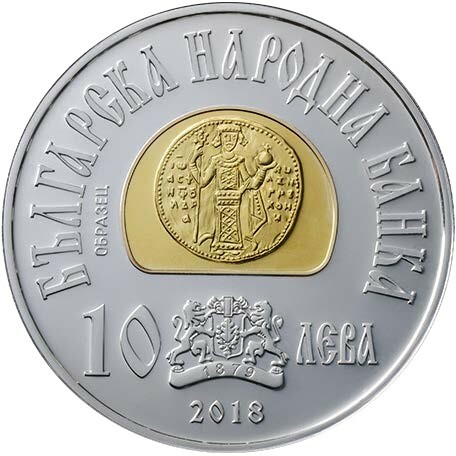 The obverse of the coins features a gold-plated medallion etched with the official seal of Tsar Ivan Asen II, the nominal value of 10 ЛЕВА (10 levs), the BNB logo, and the year of issue 2018 inscribed underneath. The text, БЪЛГАРСКА НАРОДНА БАНКА (Bulgarian National Bank), is inscribed along the top edge. 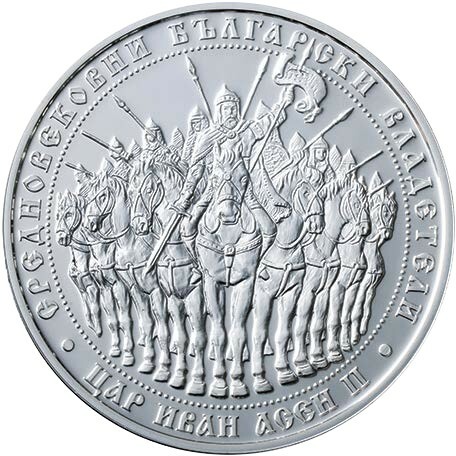 The reverse of the coins, features, within a decorative circle, the cavalry led by Tsar Ivan Asen II with the broken alliance treaty pierced on his spear. The inscription СРЕДНОВЕКОВНИ БЪЛГАРСКИ ВЛАДЕТЕЛИ (Medieval Bulgarian Rulers) is placed above the primary design along the upper edge with ЦАР ИВАН АСЕН II (Tsar Ivan Asen II) seen below and along the lower edge. Each coin is encapsulated and presented in a branded Bulgarian National Bank custom case, accompanied by a numbered certificate of authenticity. Previous coins in the series have included: 2011, Khan Krum; 2013, Czar Samuil; 2014, Czar Simeon the Great; and 2017, Khan Tervel. The coins are distributed in Bulgaria by the Bulgarian National Bank teller desks at the Cash Centre, 1, Кnyaz Alexander І Square, 1,000, Sofia. They will also be available from the First Investment Bank AD, Raiffeisenbank (Bulgaria) EAD, and Texim Bank AD for those residing in Bulgaria. What an amazingly beautiful coin!